Ball and cone earrings. One of the most common trade goods during the 18th c. We're offering these at a very reasonable price! 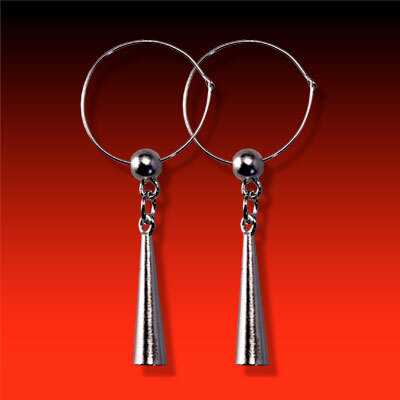 Ball and cone earrings appear on almost all of the trader's inventories. Authentic linked ball and cone to move independently. Add them to any of our ear wheels for an authentic look! The ball and cone portion measures 1 1/2", and when including the ear wire, measures approximately 2 1/4", ear wire diameters vary slightly in size. Due to variations in how these were worn, we're offering them singly and as pairs; see ERG-22 for singles. Modeled after original 18th c. cast pieces. Cast in bronze, finished in fine silver. These will tarnish over time. Sterling silver ear wires. Sold as pairs. After quite a period of time, our website is back up and functioning again. We do appreciate everyone's patience with this, as no one was more frustrated than us here at Indian Trade Silver. We still have a lot of work to do to it, but we're back online. We will be getting our inventory built back up and adding some new products for the upcoming season, so check back occasionally! Once again, thanks for your patience!